White sugary sand beach and fun exciting activities! Boracay Island is situated off the northwest corner of Panay Island. The stunning and exquisite pictures you’ve seen are likely from the White Beach – the main tourism beach which is a four kilometers of white chalky sand and is lined with shops, resorts, hotels, and restaurants to dine in. First week of August, right after our Singapore getaway, we headed to Boracay. My best friend is a devoted tourist of this paradise as she’s been here four times in a row. My first visit was 2 years ago, on February 2014. I was mending my broken heart and this island has been my sanctuary. Tourism is at its peak in the months of November to May because of the Amihan season (Northeastern wind blow). Whereas, this time of the year is rainy season and we thought that we’ll have the beach on our own but we were wrong. I guess, it’s peak season the entire year here in Bora – the tourist coming in and out is ceaseless. Koreans hanging out in D’Mall. When we arrived, the beach is packed with tourist as usual, mostly Koreans and Chinese but there are still a lot of tourists from different side of the world. In 2014, the usual sight in the beach was white people tanning their bodies, and flaunting their bikini bods. This time (2016), you’ll more likely see Koreans and Chinese dominate the tourist population in Boracay. I guess this is the result of Airline companies such as CebuPacific and Airasia offering a direct flight to Kalibo from these countries. Aside from the increase of tourists, I was amazed to see that there are new restaurants and hotels opened, now they have: Chinese, American, Italian, Korean cuisine, etc. a variety for your taste buds to enjoy. If you are in a budget like us, there are Filipino restaurants that serves “silog”, sinigang and other main Filipino dish for only P99.00 or you can have the popular spicy chicken in Mang Inasal with unlimited rice and soup. What I like about white beach is its fine dusty sand and turquoise water. It’s like I’m swimming in a large pool. The color of the water changes from skyblue (near seashore), turquoise (middle) and blue (afar). In the background, you’ll see romantic paraws and colourful parasails. Station 1 is in the northernmost section; it has the best and most expensive resorts and occupies the widest Beach front. Station 2 is at the center, it’s where people eat, shop and party. Station 3 is in the southernmost side; it’s quieter and less crowded. 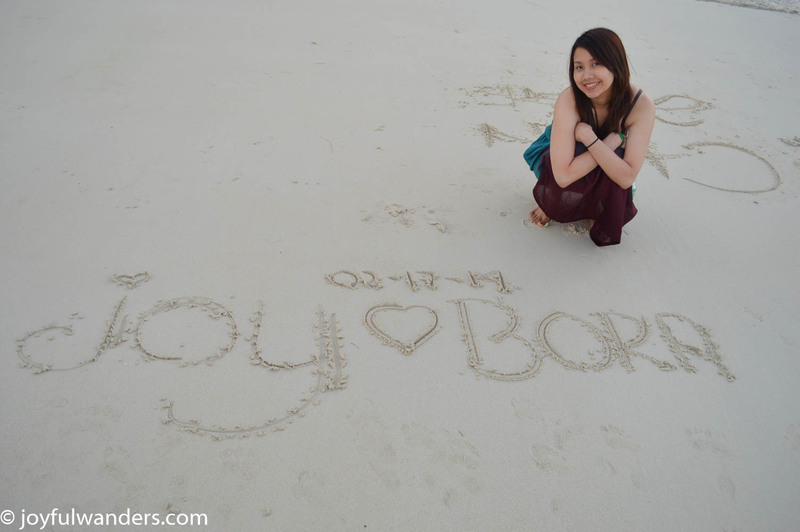 If you’re looking for adventures, boracay offers a variety of activities according to your interest. Banana Boat (water sled) – This might be a common beach activity here in the Philippines but it’s never boring. The price starts at P250 for a minimum of 5 persons and the allotted time is 15 minutes. Fly Fish – For a more exciting and thrilling activity after trying Banana boat, try this activity. Make sure you hold on tight while the fly fish glides and flies into the water. Minimum of 3 person, estimated time is 15 minutes and price starts at P400-600/person. Parasailing – Enjoy the breathtaking view of the beach and blue skies while you’re up in the air. Time span is 10 minutes for P1,500/person for 2-3 flyers. Island Hopping with snorkeling – visit the surrounding beach such as Crystal Cove, Coral Garden, Crocodile Island, Puka Beach/Ilig-Iligan Beach, and Ariel’s point and meet fellow tourist while enjoying the coral view in the island. This includes free snorkeling mask, life vest, and lunch. Price starts at P500/person (local price). Paraw Sailing/Sunset Sailing – Those who love dusk like me will definitely enjoy this activity. Price starts at P1,200 -P1,500, minimum of 1-4 persons, and estimated time is 30 minutes. Jet Ski – The 15 minutes ride for only P1500/2 person, and P2000 for 30 minutes is exciting as it sounds. Kite Surfing and Windsurfing – If you want to try this activity, you’ll have to enroll for a kite or windsurfing course. Price may vary; if you’re a pro, you can enjoy this for only P2,500/person for an hour. 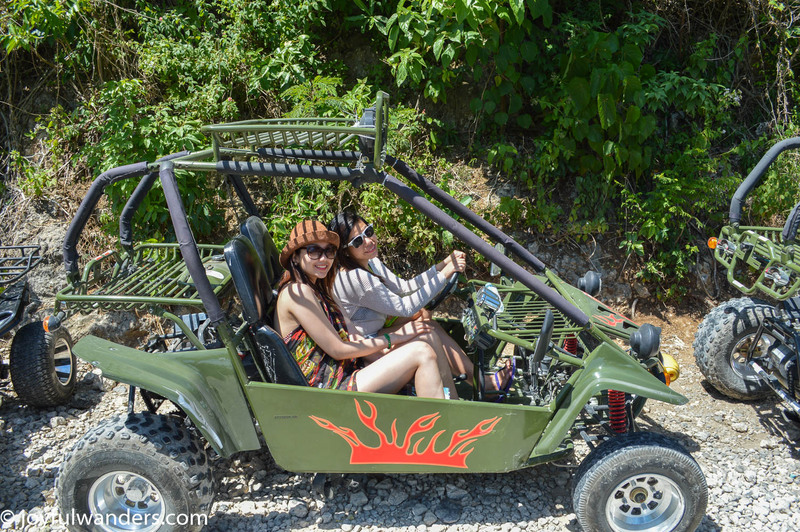 ATV – Enjoy the highway ride going to ocean tower (free entrance) for only P500-P1000/person with. This is only good for one rider. Allotted time is one hour. Buggy Car – This is perfect for couples and friends who’d like to ride together. Price starts at P2000 good for 2 person with free entrance either Mt. Luho or Ocean Tower. Allotted time is one hour. Go Kart – For car racer wannabe like myself. Price starts ar P1,500 (Single seater), P3,000 (Double seater). Scuba Diving – Take your adventure to the next level and try scuba diving for only P2,500/person (No license) and P2,000/person (with license). Total allotted time is 2-3 hours. Cliff Dive – This is included in the island hoping and you need to pay P150 for the entrance fee at Ariel’s point. Mermaid Swimming – I wish to try this out on my next visit. Price starts at P1000/person. Visit philippinemermaidswimmingacademy.com for full details. Stand Up Paddling – This is not easy as it seems. If you get bored by just swimming, try this out for only P300/2-3 hours with free instructor! Pub Crawling : Party all night, dance your heart out, and drink till you drop. The price starts at P800 which includes free entrance and drinks. Tired after the fun and exhilarating activities you did for the entire day? Indulge yourself in a relaxing massage just in front of beach, get a tattoo, or have your hair braided. On our end, we went back to our hotel for a warm shower and rest for the long night ahead of us. Definitely you’ll never run out of things/activities to do here. Take the plunge and have fun! Singapore’s top attractions to visit for first timers.